Every time some overinflated Hollywood celeb or irrelevant British royal says we all have to become vegetarians to save the planet, I think about how rarely I’ve seen wildlife in a vegetable field. No elk, no pronghorn, certainly no mountain lions. And if I do happen to see a rabbit or a prairie dog among the veggies, I know whoever planted them is doing everything they can to get those uninvited guests out of there to keep them from eating up the produce or polluting it with e coli.And wildflowers? In a field of vegetables wildflowers are considered “weeds” and treated as such. On the other hand, visit a cattle ranch here in the West and you have a good chance of seeing deer, elk, pronghorn, coyote, black bear, bobcat, rattlesnakes, gila monsters, road runners, Gambles quail…. the list is too long to print here. Get lucky and you might see a mountain lion. I know a rancher who has seen a couple of jaguars on ranchland here in Arizona. As for wildflowers, as I write this, I’m looking at a ranch out the window of my camper, and I can see giant saguaros, cholla cactus, palo verde and creosote bush. The Arizona poppies, brittlebush, and desert marigolds were spectacular this spring, and the native grasses are providing plenty of forage for wild and domesticated animals alike. An activist vegetarian responding to what I just said would point out that growing vegetables requires a lot less land than raising meat. This enables us to protect more land and allow it to return to nature so it can be home to even more wildlife and wildflowers. That would be an effective counter-argument if it weren’t true that raising meat on the land can benefit it ecologically even more than protecting it. Scientists who’ve studied the matter tell us that grasslands and grazing animals evolved together and developed an interdependence similar to so many other mutually beneficial relationships in nature: bees and flowers, beavers and meadows, reef fish and coral. When cattle are managed so that they act like natural grazers, i. e., when they are kept in herds and moved across the landscape in response to conditions of moisture, season, and other natural factors, they create this same kind of interdependence. That’s why cattle have been successfully used to restore ecological health to land that has been damaged by mining, by raising crops in ways that exhaust the land’s fertility, and even by the environmentalists’ panacea “protection.” For instance, in Arizona and Nevada, cattle have been used to return native vegetation to denuded mine sites and piles of mine waste on which other forms of reclamation had failed. How do they do it? By stomping in seeds and mulch and nourishing the mixture with their own natural fertilizer. Sheep and goats have been used to create firebreaks and remove nonnative plants at various locations from East to West, and sheep, goats, and cows have been used to revegetate land damaged by catastrophic wildfire. I haven’t heard of a single case of soybeans or broccoli being used to achieve any of that. 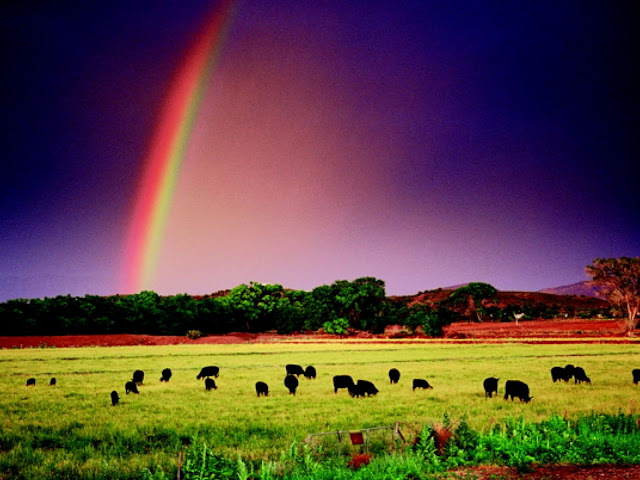 As for all that cow flattulence and belching the anti-meat folks tout as a cause of global warming, properly grazed grasslands have been shown to be so effective at sequestering carbon in green and growing grass that some ranchers have been able to supplement their income by marketing carbon offsets created by their naturally-managed cattle. Acknowledging the effectiveness of these techniques the state of Florida has come up with a plan to contract with ranchers to use their livestock to improve that state’s rangelands’ ability to absorb, clean, and sequester water. One of the aims of this program is to raise the water level in the Everglades. That’s right. Florida is using cows to rewater the Everglades. On the other hand, when grazers are removed from the land the ecological results can be disastrous. In Central California, when cattle grazing was removed from seasonal wetlands called vernal pools, the native plants and animals that live there, some of which are endangered, were displaced by nonnative weeds in as few as three years. When grazing was resumed the rare plants and animals returned. Also in California, the threatened bay checkerspot butterfly has disappeared from lands from which cattle grazing was eliminated — to protect the butterfly. On lands that continue to be grazed the butterfly has managed to persist. Because of this and similar instances “cessation of grazing” has been recognized as one of the main threats to some of California’s most sensitive ecosystems by the California Rangeland Conservation Coalition. That organization includes The Nature Conservancy, Defenders of Wildlife, and Audubon, among others. And, for those of you who have been reading this blog for a while, you may remember (and want to link back to) the story of the native fish in Arizona (the spikedace) that was sustained by grazing for more than a century and exterminated in less than a decade by “cessation of grazing,” or the Drake exclosure that’s been protected for more than 60 years and is as bare as a parking lot while the grazed land right next to it is covered with native grasses. Meat is the only human food that can be raised on land that is officially designated wilderness. Not so with vegetables. Meat can be raised on land that can also be used for recreation such as hiking, mountain biking, hunting, fishing, horseback riding, orving, downhill skiing, and birdwatching. Vegetable fields are off limits to most of those. Just try riding your orv or your horse through someone’s field of bok choy. So, the next time you chow down on a big juicy steak or leg of lamb, give yourself a well-deserved pat on the back for saving the planet, and remember that you are enjoying the only food that can be raised within a diverse, native, openspace ecosystem in such a way that it restores, sustains, and even enhances that ecosystem. On second thought, maybe you ought to order two steaks. It’s going to take a lot of cows to remedy all the ecological damage perpetrated by vegetarian environmentalists. Interesting perspective. One question still lingers though. What about the deforestation involved with animal agriculture (specifically cattle)? Would you claim that the carbon sequestered by cattle fields is equal to or higher than that sequestered by old growth forests? Thanks for the letter. I enjoyed receiving it and I’m enjoying responding to it. Do you know of any old growth deforestation associated with animal agriculture (specifically cattle) currently happening in the U. S.? Can you tell me where it is? I know that did happen in the past, but it isn’t happening currently anywhere here in Arizona or the rest of the West that I know of, and if there was I’m sure it would have inspired a huge bunch of lawsuits by enviro groups. There is, however, plenty of land, that is being decattled, and degrazed, here in the West, and I know where lots of that is — thousands, maybe millions of acres. I live in an area surrounded by it. I’ve taken photos of it. Those photos are all over my website. Take a look and/or come on out and visit. I’ll show you. As for carbon sequestered by areas grazed in the way I described in the article you mentioned, — Is it equal to or higher than that sequestered by old growth forests? I would say it is several orders of magnitude higher. One reason is, there are several orders of magnitude more grassland in the American West than there is old growth forest as there has been for several thousand years. Another reason effectively grazed grasslands sequester more carbon than “old growth forest” here in the West is, grazing areas act as a very active carbon pump, pumping carbon into the soil especially when they are grazed in the “mimicking Nature” way. That’s why the soils of the Great Plains used to be black with carbon. Some of them are being grazed to blackness again. Actually, that kind of grazing even helps old growth forest remain ecologically functional and able to sequester carbon. Check some of the other posts on my website. I checked “Eat Meat and Save The Planet” – the post you mentioned. It doesn’t have any photos. Most of the other posts do, but the best for your purpose might be DOES ENVIRONMENTALISM WORK? CONDUCT YOUR OWN ECOLOGICAL STUDY. It has a lot of what could be called “old growth forest” here in the Arizona rangeland (juniper trees). We even had a scientist come by and check to see how much carbon this protected site is sequestering — not much, especially when compared to surrounding grazed rangeland.